Put Tofino on your Canada travel list if you haven’t done so already. This sleepy town on the tip of Vancouver Island is famous for its wild, rugged, and raw beauty that’s simply captivating. For three days, I explored the Wild West Coast of the Pacific Rim National Park Reserve and got adventurous with rainforest hiking, hot springs, whale-watching, and eating a lot of fresh seafood. A special note to brides: you don’t need to go south for a honeymoon with rainforest, surf, beach, and romance. We have it right here in our own backyard in Tofino! Tofino is a two hour drive from Nanaimo and five hours from Victoria. Stop to absorb local Vancouver Island wineries, ancient cedars at Cathedral Grove, and spectacular mountain scenery along the way. Short on time? 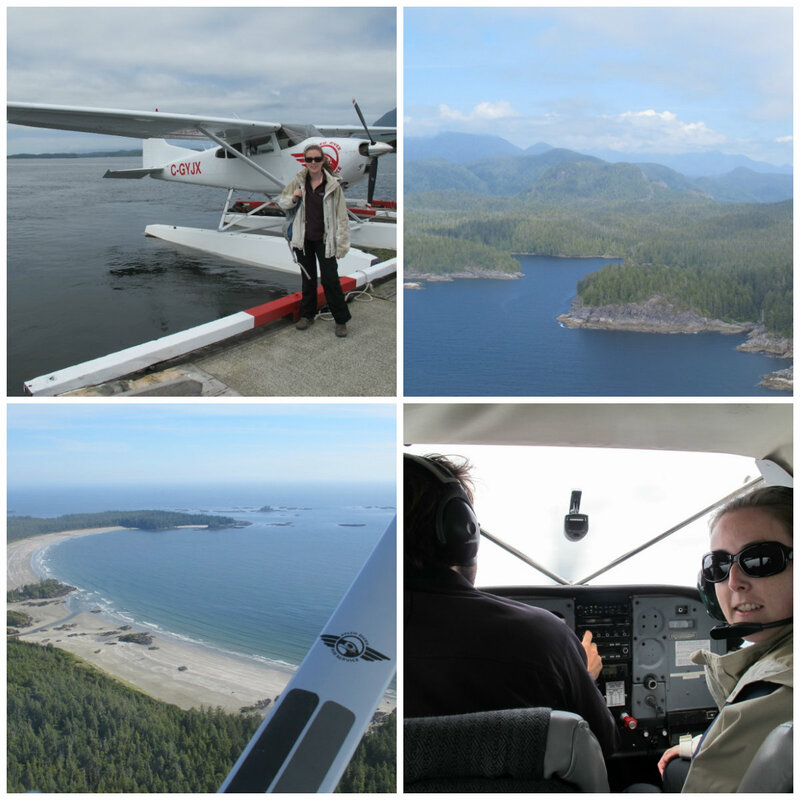 Tofino is accessible by air from Vancouver, Victoria, Comox Valley, and Seattle. The Wickaninnish Inn: For a splurge, check into this Relais & Châteaux hotel (below) with five star service and panoramic views of the Pacific Ocean. 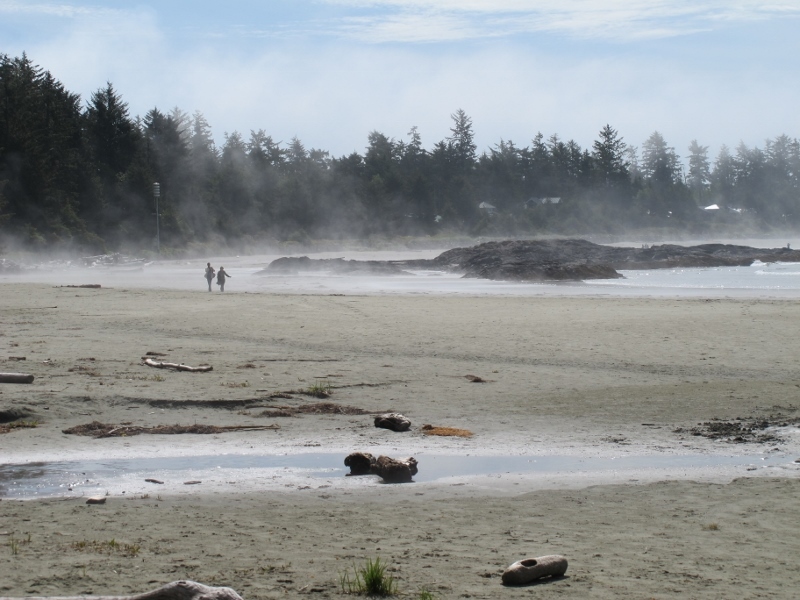 “The Wick” is also the sole resort on Chesterman Beach – Tofino’s longest beach at 2.5km of white sand. Set against a backdrop of rainforest, two cedar buildings have luxurious rooms with ocean or beach views, gas fireplaces, spa-like bathrooms, and balconies. For the ultimate relaxation, book a treatment at the Ancient Cedars Spa. Leaving “the Wick” nearly sent me into tears. My experience was so special that I’ll be doing a full feature on Wickaninnish Inn next week. If you’re on a budget, check out the Green Point campground at the Pacific Rim National Park Reserve. The campground fills every night during the high season, so make sure to reserve online in advance. The park is open year round, but the campground is open from May 1 to mid-October. 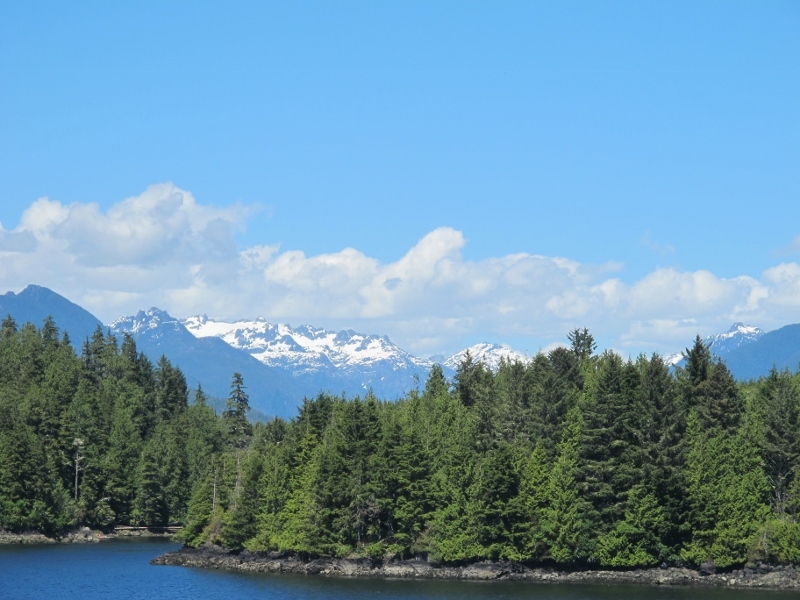 Rainforest, Sand, and Wildlife: Thanks to the coastal temperature, Tofino has a cool and wet maritime climate, producing white sand beaches and lush rainforests teeming with life. 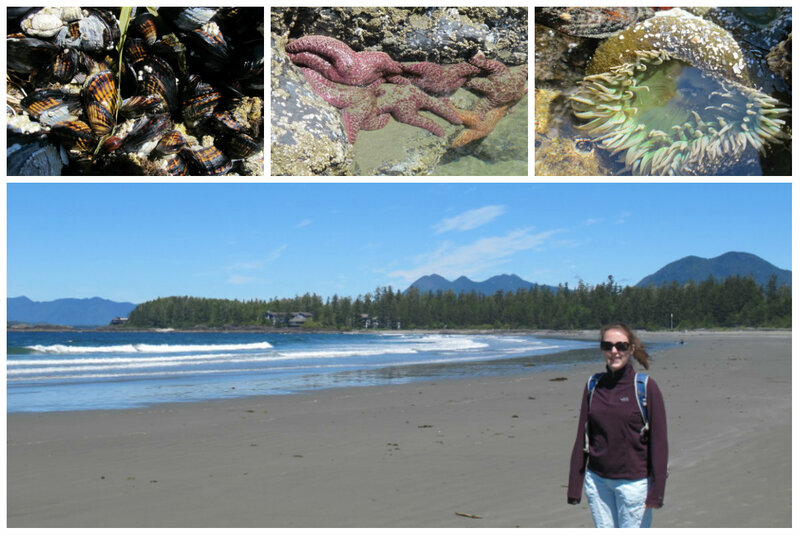 In Pacific Rim National Park, I spotted giant slugs, 1000-year old cedars, and purple starfish clinging to rocks. 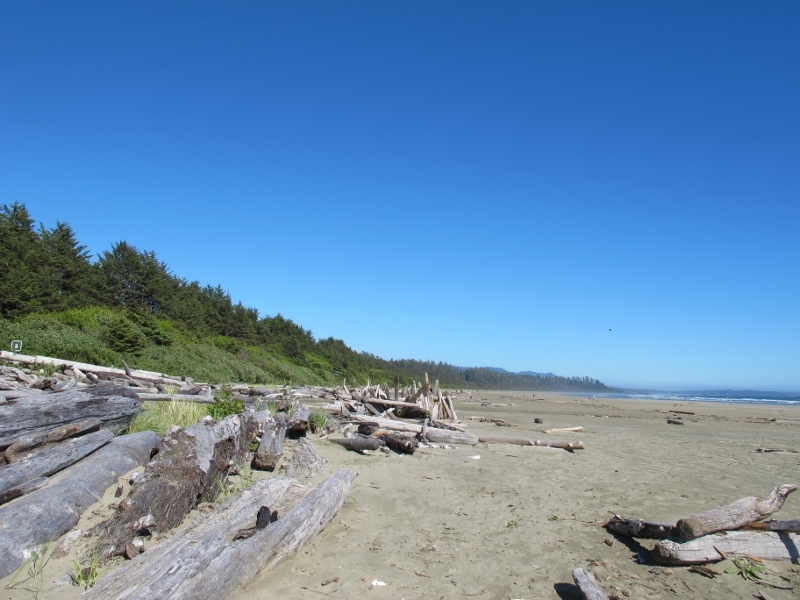 Take a long walk on Chesterman Beach or Long Beach to soak up sand, surf, and sun (above). I explored the coral covered in mussels and purple starfish, and could actually hear the coral or the mussels (not sure which one) snapping in the sun. Whale Watching: There are plenty of outfitters who offer expeditions from open Zodiac-type of boats. Some outfitters offer covered vessels and wheelchair accessibility too - something for everyone! Whale watching can be a challenge, so bring binoculars, warm clothing, and a dose of patience. If you’re prone to sea sickness, bring anti-nausea pills in case it gets bumpy on the water. Another option is to take an Atleo Air seaplane to get a bird’s eye view (above). 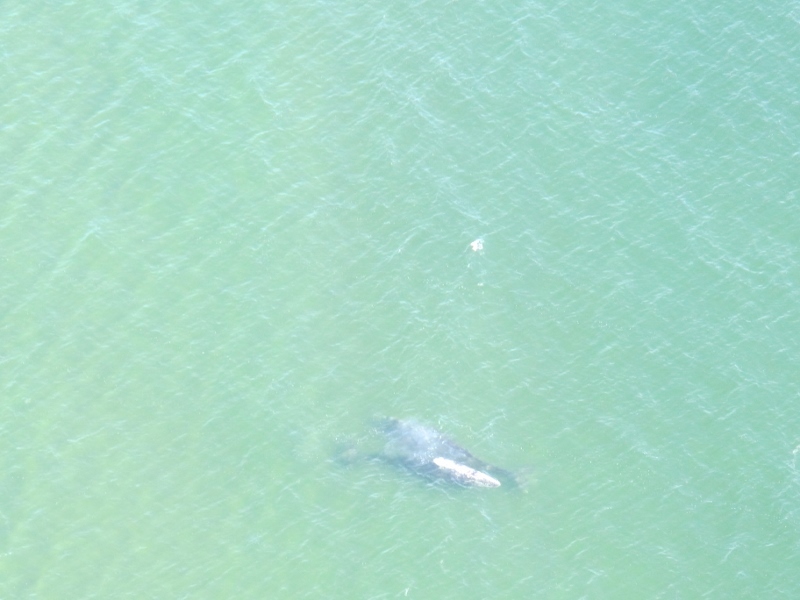 On the way back from the hot springs, our pilot swooped in close to the ocean so we could see the whales. Storm Watching: From November to March, watch violent storms from the Pacific Ocean. 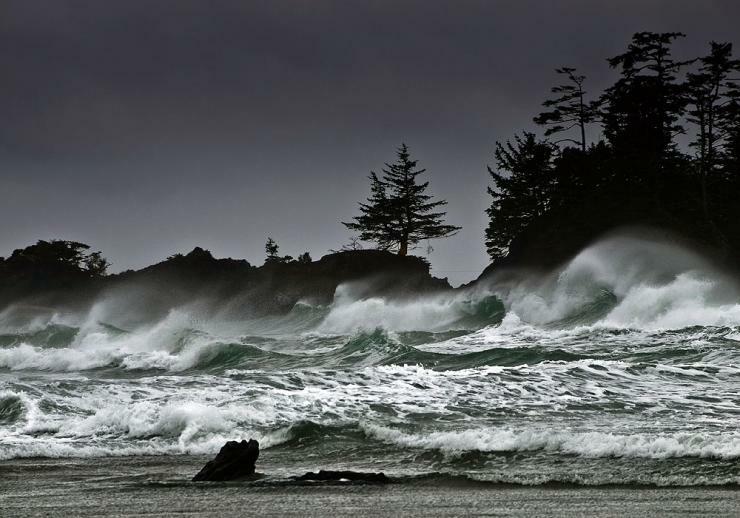 Tofino has some ideal storm watching spots, such as the Kwisitis Visitor Centre in the Pacific Rim National Park Reserve. Dance in the storms wearing a yellow slicker, or watch the show from a local restaurant with a hot drink. Either way, you'll never look at stormy weather the same way again. Hiking in the Pacific Rim National Park Reserve: Pacific Rim has a plethora of trails with rainforest, rugged beaches, and wildlife (watch out for giant slugs!). The Rainforest Trail and Schooner Cove Trail are good warm up hikes. The Schooner Cove trail descends through young and old cedar forest and ends on the beach overlooking the village of Esowista, belonging to the Tla-o-qui-aht First Nation, who have lived along this shore for centuries. Pacific Rim is located on the traditional territory of the Nuu-chah-nulth First Nations. 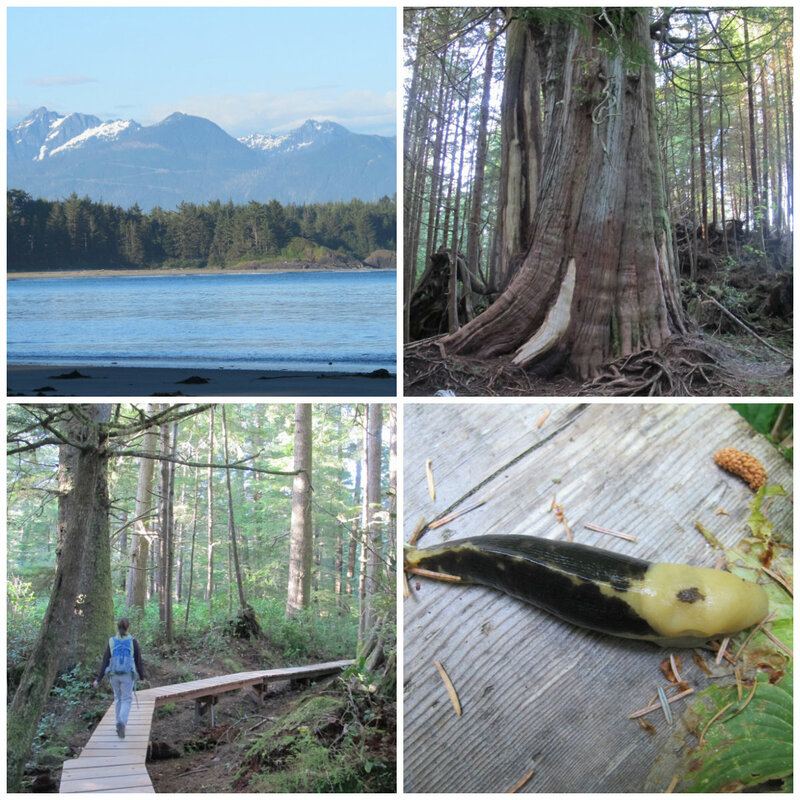 One of my favourite hikes was the Nuu-chah-nulth trail –a 2.5km interpretive walk that offers a glimpse into Nuu-chah-nulth history, culture, and traditions. Soar from the Skies & Soak in Remote Hot Springs: Jump on an Atleo Air seaplane to explore hot springs at Maquinna Marine Provincial Park (below). 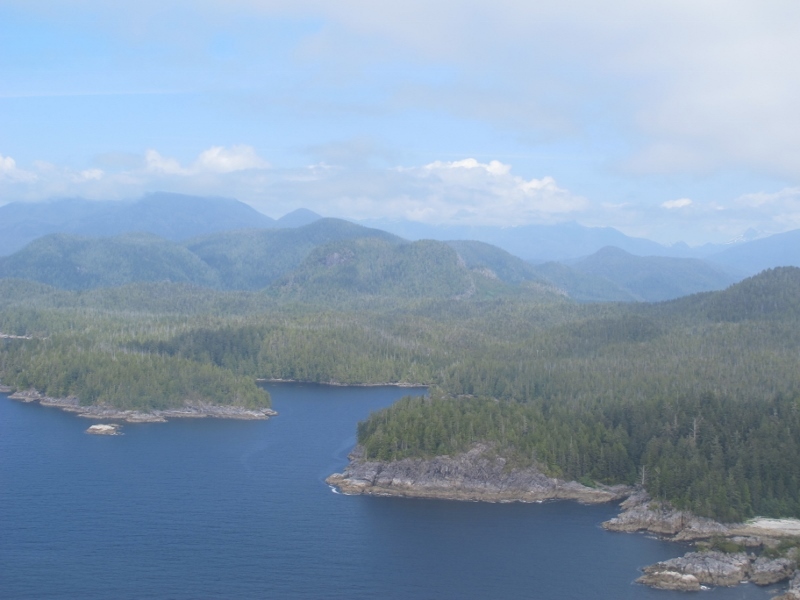 While visitors can access the park via 1.5 hour boat ride, it’s a thrilling experience to see Tofino from the air, and takes only 15 minutes to reach the park. Plus I got to sit in the co-pilot’s seat! It’s a half hour rainforest hike to the cove, and worth every step to soak in these hot mineral spring pools. The geothermal hot springs cascade down a waterfall into half a dozen rocky pools – each one ranging from scorching hot to a warm bath temperature. This was the highlight of my visit and an experience not to be missed! 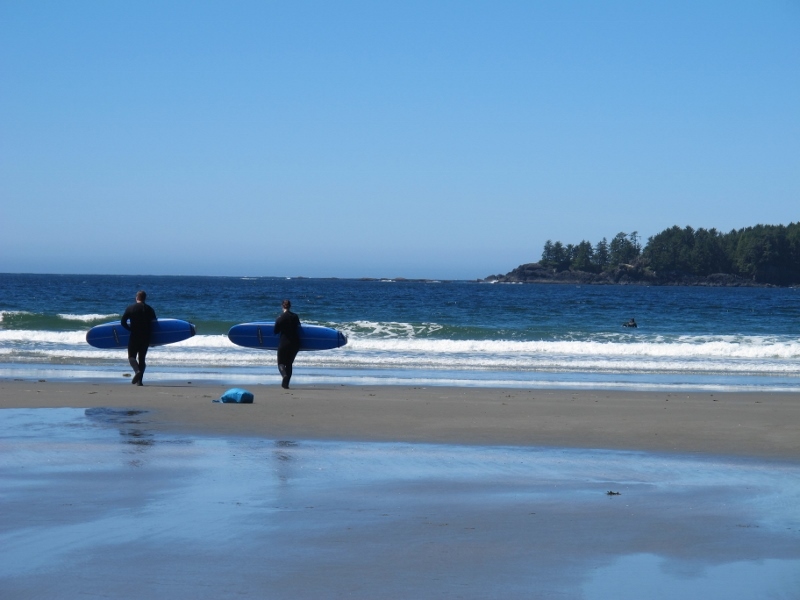 Surfing: Tofino is a hot spot for surfers with 35km of surf-able sandy beach break. Surf schools offer lessons and surf camps, where certified instructors teach proper surfing technique, ocean safety, and surf etiquette. Note that the water is cool year-round – which is why everyone wears wet suits. If you’re visiting in June, head down to Cox Bay to watch professional surfers compete for the top prize at Rip Curl Pro Tofino/Canadian Surfing Championship. In October, don't miss the Queen of the Peak women's surf championship - where competitors are as young as 7 years old! It brings a whole new meaning to go you, girl. Go Ziplining: Fly like an eagle over river canyons and rainforest on this zipline, located just 45 minutes outside of Tofino. The experienced guides at West Coast Wild Adventures take you on a six-zip tour into cedar, fir and hemlock old-growth forest before soaring over the rugged Kennedy River Canyon. Follow your nose to the Wildside Grill for fish and chips with an upscale twist. Don’t be fooled by the rugged exterior of this take-out eatery – it’s a gourmet feast on the inside. Everything on the menu is fresh and locally sourced. The salmon, shrimp, and prawns are caught from the owners’ boat, using environmentally friendly fishing methods. And by gum, those are some damn delicious dishes. 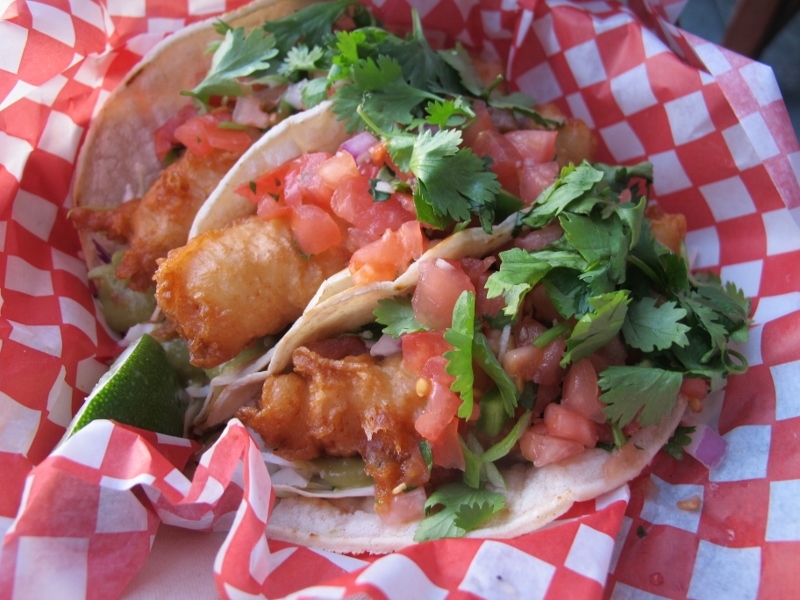 I ordered a second helping of the fish tacos – mini tortillas topped with battered ling cod, cheese, lettuce, avocado, fresh salsa, and chipolte mayo (above). Looking for a little romance? Make a reservation at The Pointe Restaurant (above) for brunch or for a sunset dinner. This restaurant offers hearty West Coast cuisine and panoramic vistas of the Pacific Ocean, Chesterman Beach, and surrounding islands and wildlife. Tofino has its own brewery, crafting originals like the Tuff Session Ale and the seasonal Dawn Patrol Coffee Porter. Sample five different local beers and go for a tour at the Tofino Brewing Company. Visiting in May or June? Join the boat-to-table culinary extravaganza at Feast Tofino and the Tofino Food & Wine Festival. -- Lisa Jackson is a freelance writer and blogs at Eat Drink Travel Magazine. Find her online @eatdrinktravels. Want to visit Tofino? Check out the Tourism Tofino website for more ideas and information.